Sciatica is described as a radiating pain that runs from the lower back or buttock down one leg. There may also be a feeling of weakness or numbness. 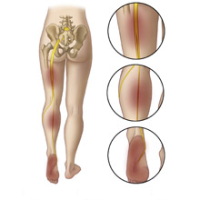 The symptoms may be due to damage or pressure to the sciatic nerve, a large nerve that runs down the back of each leg and controls the muscles while also providing sensation. The symptoms usually occur suddenly and may take a few weeks until symptoms go away. Injury or damage to the sciatic nerve can bring sciatica. In most cases though, no cause is found. Injuries that cause sciatica include hip fractures and motor vehicle accidents. Back disorders such as slipped disc, disorders such as osteoporosis and osterarthritis can compress the sciatic nerve. Other things that may cause nerve damage include diabetes, Lyme disease, and spinal stenosis, which is a narrowing of the bone column that occurs in older age. In some cases, sciatica can happen due to a tumor or blood clot near the sciatic nerve. When lifting heavy objects, it’s important to use legs instead of the back. With this in mind, it is important to bend at the knees when lifting heavy objects to prevent back injury. Osteoporosis can be prevented by getting the recommended value of vitamin D and calcium. The risk of diabetes can be significantly decreased by exercising regularly. Tick repellant should be used when outdoors in tick-prone area in order to prevent Lyme disease. Lying on the back for prolonged periods should be decreased to minimize the pressure on the sciatic nerve. If younger than 20 or older than 55 and having sciatica for first time. A doctor will diagnose sciatica based on medical history, physical examination, and symptoms reported. Non-steroidal anti-inflammatory agents (NSAIDs) like ibuprofen can help diminish the pain. If these do not work, the doctor may prescribe corticosteroids, such as codeine or morphine. Injections of botulinum toxin (Botox) have been shown to be effective in treating people with recurring and long-lasting sciatica. A cold compress followed by a hot compress on the affected area can decrease pain. Bed rest for longer than two days can make symptoms worse, it is advisable to exercise or walk as much as one can tolerate. Hayseed works via the compound called coumarin. Coumarin, which is a camphor-like substance, increases local blood flow when applied topically. Commission E, Germany’s agency equivalent to the FDA, has judged the effectiveness and safety of herbal therapies. The agency found that hayseed was effective in treating sciatica and a range of different rheumatic conditions. This is an ancient remedy that has been used since Ancient Roman times. The practice involves taking springs of the fresh plant and applying it topically to the area of pain. There is a minor sting which is a part of the treatment. This sting was meant to relay to the body the minor pain and to disregard the deeper pain that sciatica may cause. Chemicals in the stingers that are responsible for causing inflammation can trigger release of the body’s natural anti-inflammatory chemicals. Willow bark has salicin, which is the herbal equivalent to aspirin. It can reduce sciatic pain. Germany’s regulatory agency, Commission E, even recognizes the pain relief characteristics of willow for different conditions, from arthritis to headache. There is variation in the salicin content from species to species. It is suggested that a low dose tea is made with a a half teaspoon of dried herb, and to work way up a dose that provides effective pain relief. Long term use of willow may cause stomach distress and ulcers. It is suggested that willow bark tea is sweetened with a little licorice, in order to decrease the chance of suffering from ulcers. Those allergic to aspirin should not take willow. Wintergreen has methyl salicylate which has a great ability to reduce the pain. It has been used several ways, from internally as it was consumed in tea to externally in baths and ointments for painful conditions, such as gout and sciatica. Skin absorption is much more rapid than through the stomach. In the United States, there are more than 40 products that have methyl salicylate as the active ingredient. All are applied topically and can treat various types of pain. Most frequently they are used for arthritic, sciatica, and rheumatic pain. There is a warning, that wintergreen oil or any product containing methyl salicylate must be out of reach of children. Ingestion of a small amount can be fatal for young children. External preparations contain a significant amount of methyl salicylate and should have some kind of child resistant packaging. Chinese angelica is a popular traditional Chinese medicine. It is the leading treatment for gynaecological and has been dubbed “the female ginseng”. Chinese angelica also has some pain-relieving, anti-inflammatory, and anti-spasmodic characteristics that make it an effective herbal treatment for sciatica. Chinese doctors inject their patients with Chinese angelica extract to treat sciatic pain. A Chinese clinical trail showed that when the extract can be injected into acupuncture point used to treat sciatica, 90 per cent of those receiving the treatement reported significant improvement. It may be useful to consume it by taking it in a tea. Chinese Angelica should not be used if preganant, though. Traditional Indian Ayurverdic doctors have used this herb to treat painful muscular and nervous system complaints such as sciatica. Its active ingredient is a high concentration of ephedrine, which is best known as a bronchial decongestant and stimulant. Its main characteristic in helping relieve symptoms of sciatica is its muscle tonic quality. Mustard has an aromatic quality, which is why it is a great bronchial decongestant. Mustard is also a rubefaciant counterirritant, meaning that it causes a feeling of warmth on the skin while its counterirrient properties causes a slight irritation which distracts the body from the pain of sciatica, arthritis, lumbago, and rheumatism. The combination of heat and counterirritation give off a pain relieving effect. Have similar effects as Mustard, since herb is both a counterirritant and rubefacient. An ancient Egyptian treatment for sciatica, it is recommended to mix two tablespoons of grated ginger with three tablespoons of sesame oil and one tablespoon of lemon juice, and rubbed topically into affected area. This works because ginger has a rubefacient quality.